It is that time again where you get to know a pug from the social media scene in our popular Social Pug Profile series. 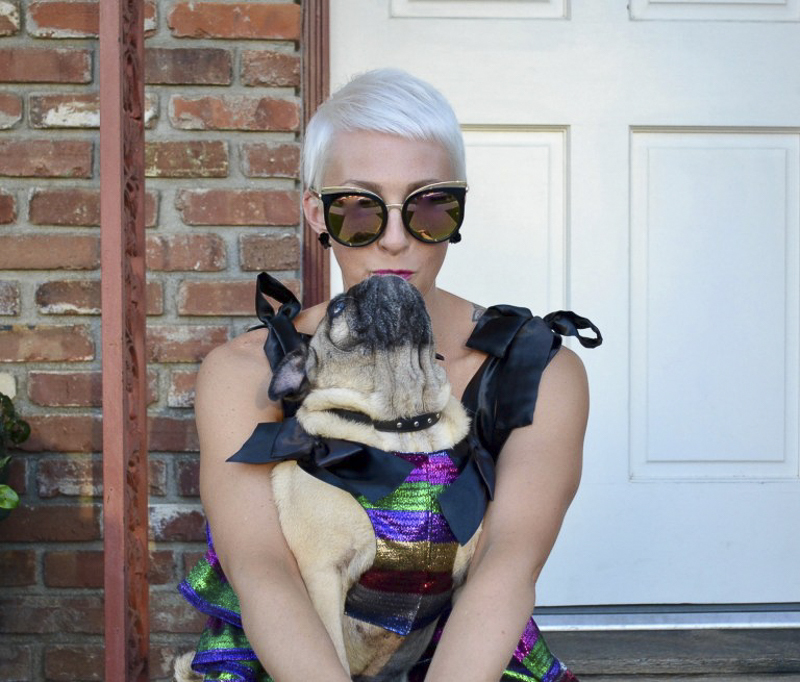 This week it is super stylish Chloe of The Stylish Bisou. Morning– I am a frisky morning girl. You’d get a shorter answer asking what ISN’T my fave food! I will try eating anything at least once, even if I’m not supposed to eat it. When we’re outdoors, mama spends most of her time prying unwanted rocks, bark and other random gross things out of my mouth! My fave foods however are carrots, apples, and fresh chicken. Funny enough, I’m not a “toy” type of girl. I’ll play with them here and there, but unlike my siblings, I’m not bananas about just one toy. I mostly luv playing with my siblings (nibbling their ankles) or with humans. NAIL CLIPPING <I am screaming this answer vehemently> !!!!!!!!!!!! Mama take me to the most amazingly patient dog groomer but I literally scream like I’m being tortured. Mama has been known to cry a time or two at my nail clipping sessions. It’s awful. Burrowing under the covers and snuggling in mama’s (or sometimes dad’s) belly. I get super happy about “bedtime” and jump on the bed excitedly! Who me? I like to crawl on mama’s lap and lick my paws on mama’s pants, so much that it makes a little patch of mama’s lap wet. It’s her only pet peeve with me. I am affectionate (which mama loves), very friendly (I love everyone), and super chill (mama loves my mild-mannered temperament). Early breakfast, outside jaunt, sometimes long walkies to the beach (but mama has to carry me in a backpack because the beach is a long walk), help mama work in her design studio (and by work, I mean nap, nap, and nap some more), dinner, snuggle with mama and then early to bed. We have a lot of fun adventures in Southern California– I love the parties we’ve been to, the restaurants we’ve tried, but maybe my fave was walking the runway at Fashion Week in San Diego! All of the wonderful friends we’ve been able to meet! Also, we love having a place to express our love of fashion. What inspired your human to create matching outfits for you & herself? It was a progression over time: mama had been doing blogs and social media for companies behind the scenes for many years to start. One day she decided she wanted to share her own voice and love of fashion, so she started the style diary, The Stylish Bisou. 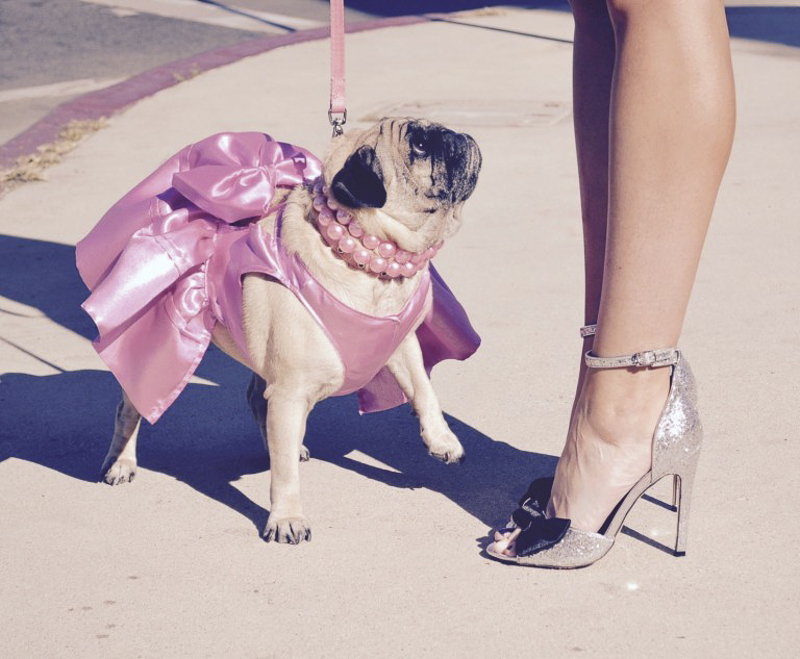 We started the style diary with coordinated outfits, but mama quickly realized that there wasn’t a lot of choice on the market for stylish outfits in pug size. So then she started putting me in toddler clothes, but she spent a lot of time altering them so that they would fit me comfortably. It finally dawned on her that making my dresses from scratch was not only easier, but then she had full control over making them stylish, modern AND extra comfortable. The last step was to start making her own clothes to match mine. Now, every week we’re in matching outfits and mama loves playing with creative designs and silhouettes for both of our outfits. What is your favourite outfit you have worn so far? My first pink Bisou Bow dress. 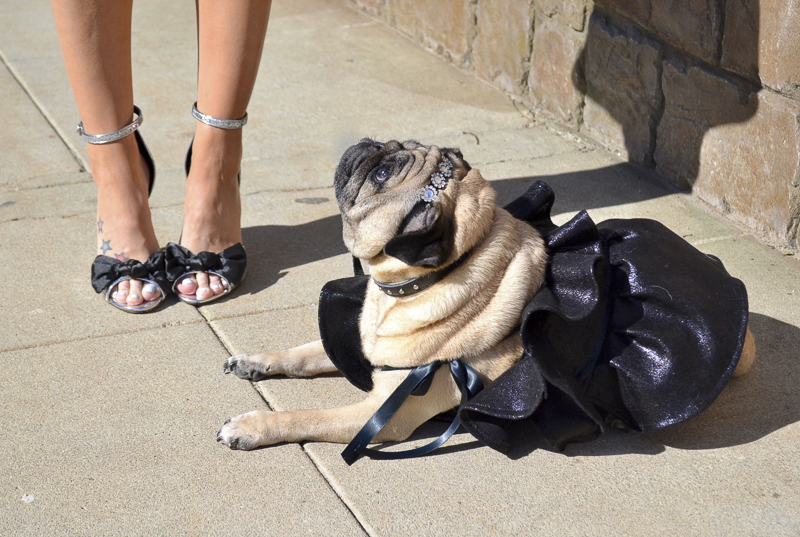 What fashion tips do you have for other pugs? Don’t be afraid to be stylish! 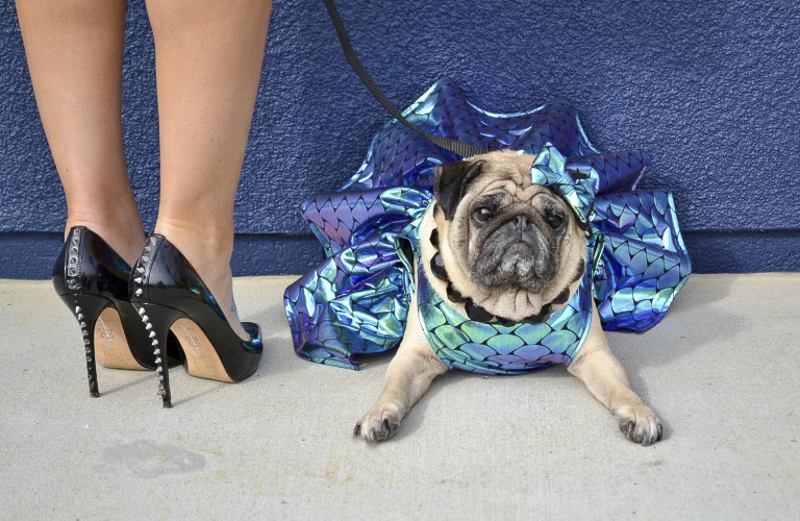 Today there are more fashionable harnesses and dog-wear that are actually comfortable than ever! 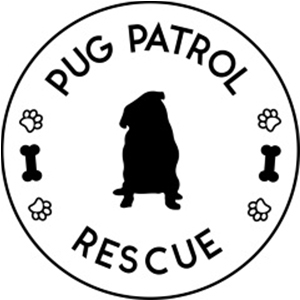 Also–pugs for the most part actually like clothing, but start them getting used to things like harnesses or sweaters/hoodies at a young age. And on a serious note, the most important fashion tip: always put safety first when dressing your dog! 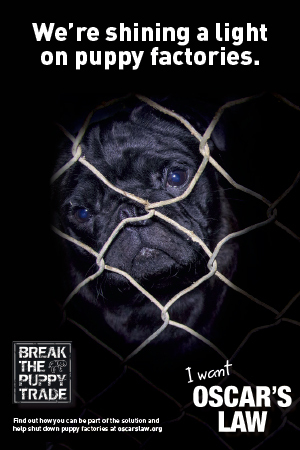 Don’t dress your pug in a hot environment and never leave them unattended in clothing! 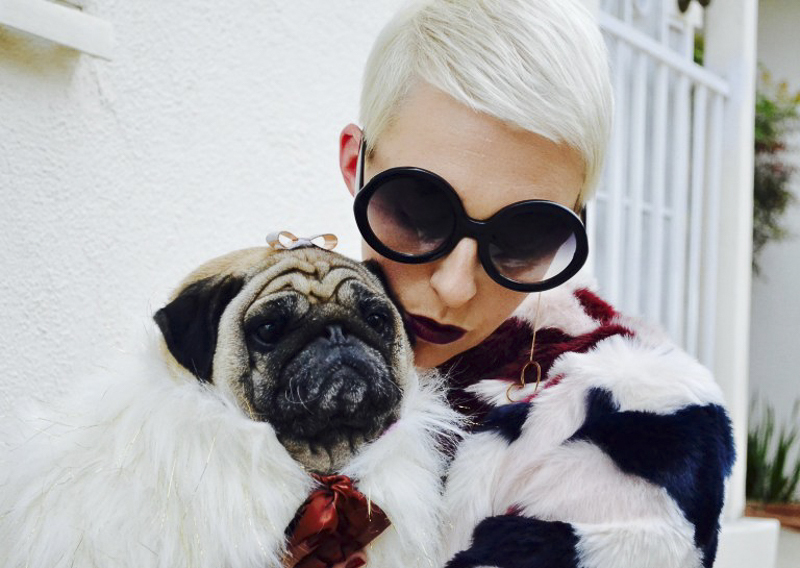 We post a weekly style diary entry at TheStylishBisou.com, but also feel free to follow us at @TheStylishBisou on Twitter, Instagram, Facebook, and Pinterest. 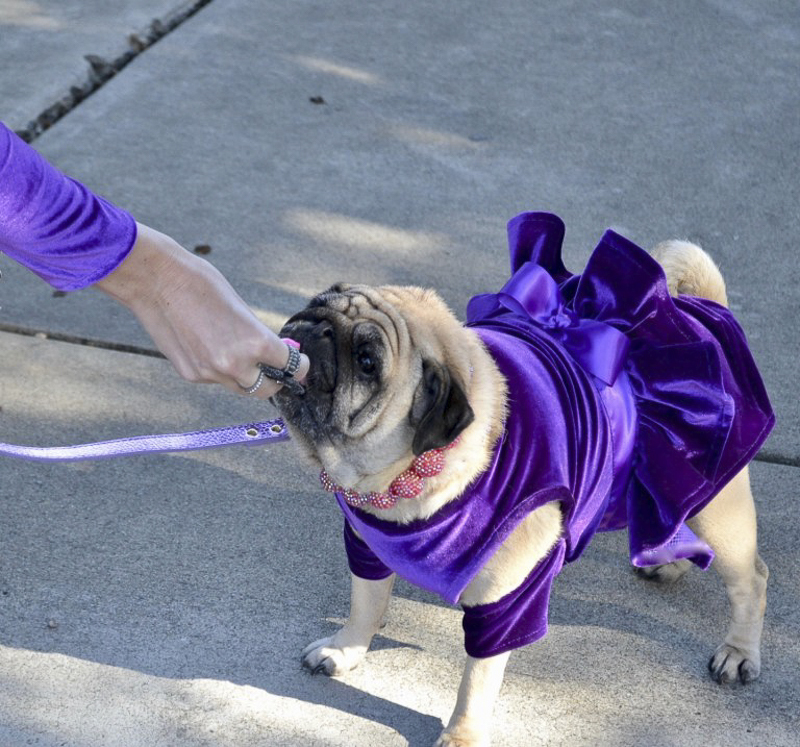 I hope you have enjoyed getting to know Chloe in this Social Pug Profile interview and be sure to leave a pug love note for her in the comments below.